The Aeronaut's Windlass is the first book in a new series by Jim Butcher. I've loved his writing in the Dresden Files and Codex Alera so I had to give this one a try. The setting is a world of magic with early industrial revolution levels of technology where all humans live in Spires that are essentially gigantic towers very far above the ground. No one ever goes to the ground because... something. It's not really explained. And that's how a lot of this book felt... not really explained. By the end of it I liked the main characters and I'm curious to see where they go next but the big McGuffin they were chasing the entire book is never actually explained or revealed to be anything interesting. It was a big letdown. But then I started thinking back to Jim Butcher's other series. They both got really good, but neither of them started particularly strong. I'm starting to think that, as a writer, he really needs a few books to get into the characters and setting before he can truly shine. 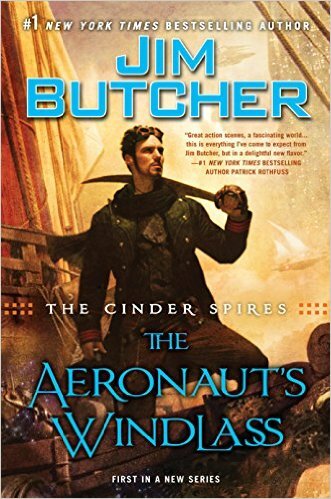 The Aeronaut's Windlass was a longish book but I enjoyed the characters enough by the end of the book that I'll pick up the next one, whenever it releases. I can't give this a rousing recommendation, but if you like Jim Butcher and were able to get into his other two series I suspect you'll be able to get through this book and get slightly engaged with the new setting. I haven't heard much about this book from my other friends that read a lot, but I'm very curious to know what others think of it. I enjoyed it quite well. The mystery of why humanity had to move into the spires and off of the ground is something that I'm sure he'll reveal over time as the series progresses. For this book, I enjoyed the characters (especially the cats!) and the plotting seemed just fine, so I'm a thumbs up for it and eagerly await the next installment. I didn't think the plot or pacing was the greatest in this book but I liked the cast a lot by the end and I think he's done setting stuff up, now he can really have fun in the next book! I'm looking forward to that one.